nano nano~ - A mummy's inane blabberings.. Boy think it's his new toy...chum. 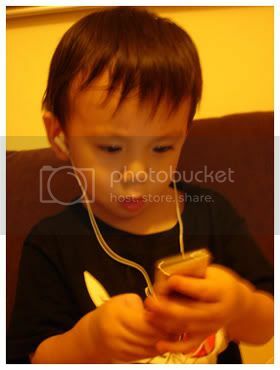 The first thing Aidan did when he took the nano out of the plastic wrapping was place it against his ears and "hallo hallo.." Alamak~!. 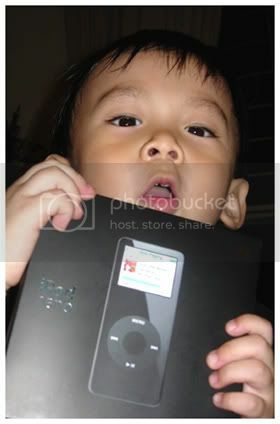 ikepod, another nano owner just gave me this link..omg, the poor iPod nano! They did a series of 'stress test' on their nano to test how vulnerable the li' bugger is..
:Dropping the nano from various heights. Our first test consisted of placing the iPod nano on a solid wood chair and sitting on it, as people are prone to do from time to time. As you can guess, this "test" yielded basically zero damage results—so little, in fact, that we didn't even take pictures. For our second test, one of us held on to the iPod, jogged about 20 feet and dropped the nano onto a sidewalk. This proved pretty uneventful as well and the nano didn't even skip a beat..
And the nano proved to be almost unbreakable. It could even withstand a car running over it...amazing! 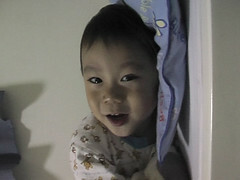 Here's a video of Aidan just before his bedtime (click on picture). Been trying to teach Aidan to speak Mandarin. We've both been speaking to him in English and had only realised the importance of the second language recently (duh!) Hubby, whose knowledge of the language is worse than mine tasked me with the duty...Gonna start slowly by teaching him how to count first. My grasp of the chinese language ain't fantastic either so I guess I'd better learn the right ennunciation or else I'll end up teaching the bugger the wrong stuff..
cool purchase! 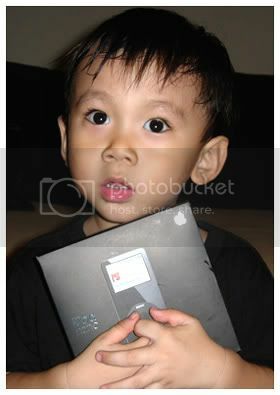 :D did you get the 2GB or 4GB one? got the 2GB one but now I'm regretting..should have gotten the 4GB! 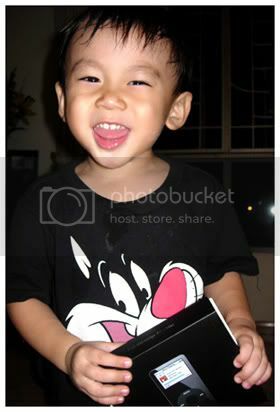 heh..MINE lah..expensive toy for the boy hor! u got it really fast!! nice! how do u find it so far? tell u later. Havent exactly tried it out yet..! Was waiting for Aidan to go to bed (which he just did). u won't believe it but i'd only remembered abt ur shop after i bought it..was like..alamak! But erm..someone's bday coming soon and i'm gonna get the white one for him :D.. You guys do engraving too? wah, you very efficient! so fast get already! heh..couldn't resist lah! been wanting to get one for my blading sessions too! Alamak Aidan sounds like a little angmoh boy learning mandarin! haha hanor! I thought so too but I only taught him last week only. Yeah..will have to make sure he gets the right 'tone'..Sad to say, own chinese also quite half-past six..wish I'd been more diligent! wah.. didnt noe they are having nano in black. they dont have it in store yet rite? hee. realised tt aidan is quite flexible in the video, he can bend his leg quite straight. ha. have you considered letting him learn kids yoga so tt he wont grow up to become inflexible? i'm sure they have both the black & white in the stores though someone said that the black 4gb is sold out already. Apple must have effortlessly moved quite a number of iPod nanos..
somehow, i wasn't tempted by the ipod, mini and shuffle but i just couldn't resist the nano! dont worry aidan can drop and throw and chew also wont spoil. Refer to agooddaytolive post. hahaha wah this is good. adding it to my entry!!!! That LJ icon of Aidan is gorgeous! Love the rich colour. im not v good with names lah! wah the lil' boy's learning mandarin now!! noticed tt he cant pronounce the 's' sound properly. wonder if that's the case too when he speaks english? yeah..same with english too although he can do sssssss very well when i ask him what sound a snake does..He seems to be pronouncing his s as x. Just hoping he will improve with time :) I didn't correct him much coz i was videotaping him but usually, we wil try to.